#GAW 64-52 - Price: $ 25.00 - $ 20.00 On Sale! - 3 Crucible of War missions, designed to be played using the contents of this box. These can be played individually, or linked together, giving you a campaign. #GAW 64-37 - Price: $ 80.00 - $ 64.00 On Sale! #GAW 64-98 - Price: $ 50.00 - $ 40.00 On Sale! #GAW 64-44 - Price: $ 50.00 - $ 40.00 On Sale! #GAW 64-48 - Price: $ 100.00 - $ 80.00 On Sale! #GAW 64-39 - Price: $ 35.00 - $ 28.00 On Sale! #GAW 64-70 - Price: $ 75.00 - $ 60.00 On Sale! #GAW 64-81 - Price: $ 100.00 - $ 80.00 On Sale! #GAW 64-46 - Price: $ 40.00 - $ 32.00 On Sale! 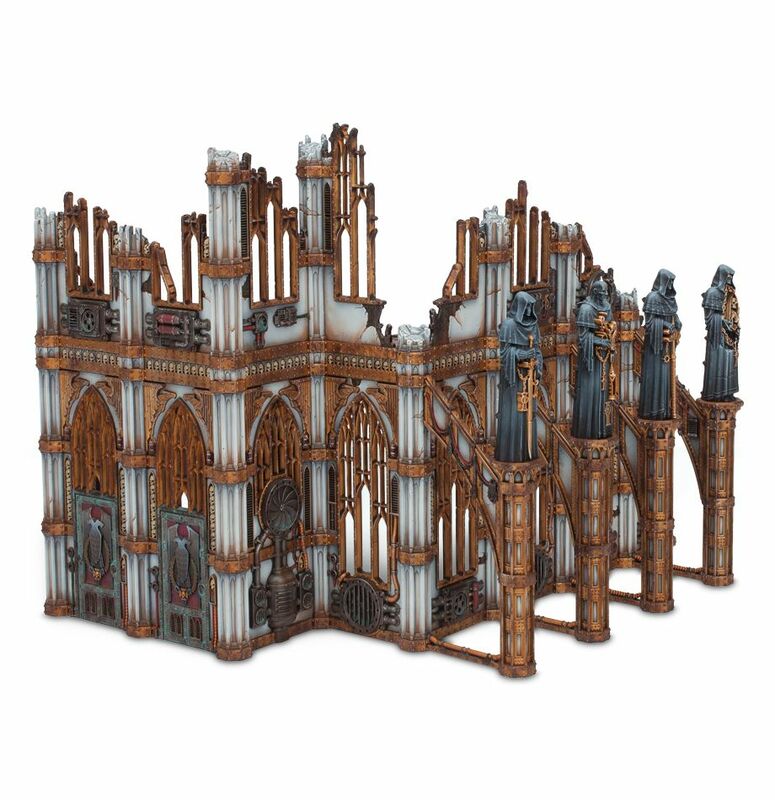 An incredibly detailed, striking scenery set, the Promethium Forge is a modular plastic kit compatible with the entire Sector Mechanicus range – detailed, configurable scenery that will help you play games on a multi-level environment! A large collection of walkways, pipes, platforms and equipment, the Promethium Forge is a splendid scenery set that provides a great terrain piece for your miniatures to battle over. Featuring a central tank, with a huge, detailed chimney, the kit features a number of walkways and platforms that can be assembled around the Forge in a whole load of different configurations, clipping into place with the plug-in holes. Each piece of the kit is covered in incredible detail, with pipes beneath the walkways, valves, displays and fans covering every surface and ladders allowing you to build multi-level structures. Of particular note is the huge, skull-shaped winching mechanism which can hang under whichever walkway you choose. 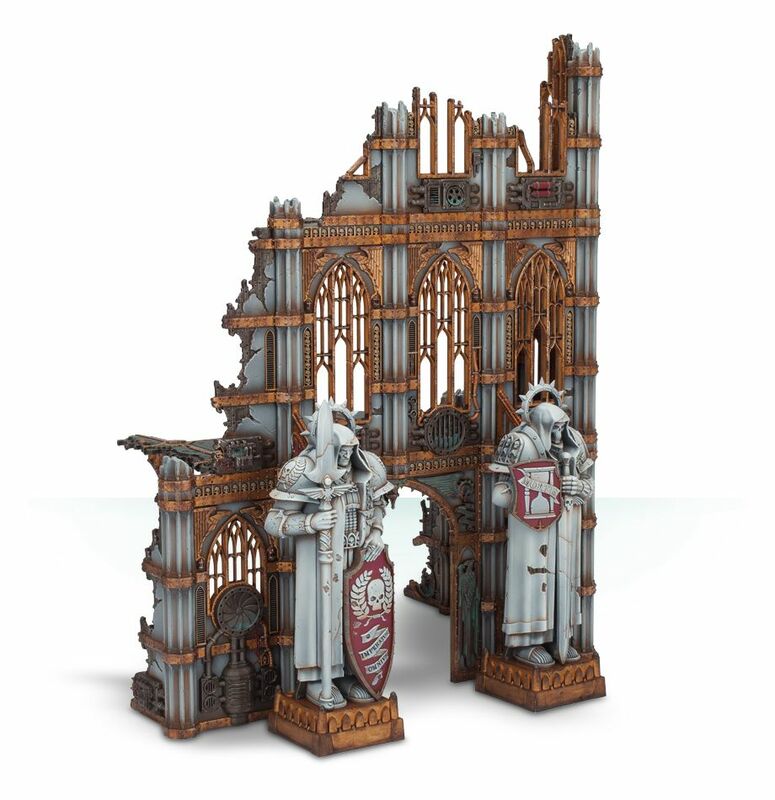 Rules are included for using this scenery piece in games of Warhammer 40,000. 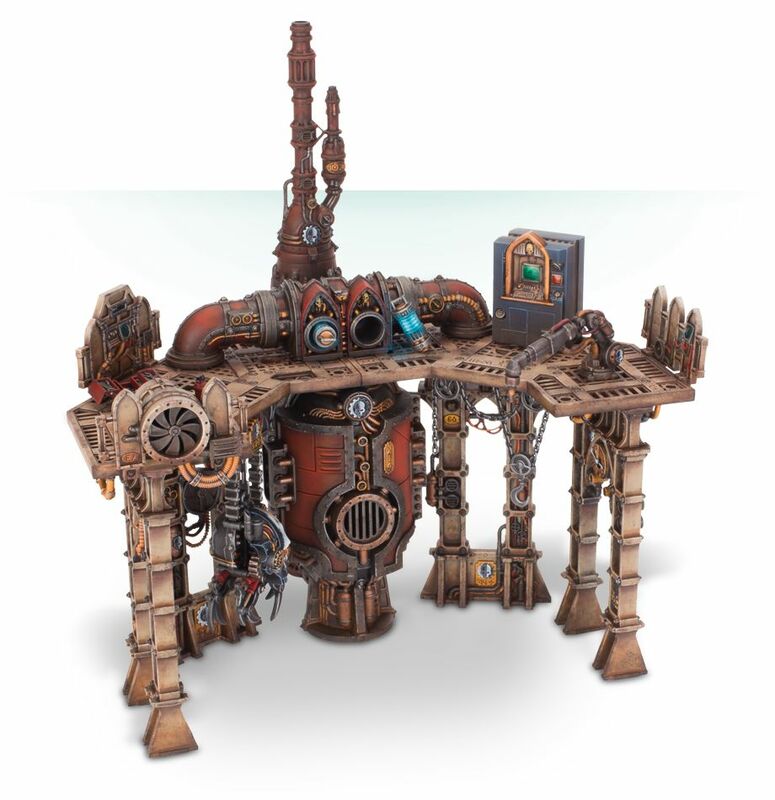 This kit contains 4 frames of plastic components – one featuring the tank and chimney of the Forge, one filled with supporting legs and two filled with platforms – and is compatible with every other kit in the Sector Mechanicus scenery range, meaning massive, multi-level labyrinthine structures can be built for your battle to be fought on. They can even be combined with the Haemotrope Reactor, Promethium Relay Pipes and Void Shield Generator. Your imagination is the only limit – no two gaming tables ever need look the same! #GAW 64-42 - Price: $ 75.00 - $ 60.00 On Sale! #GAW 64-68 - Price: $ 115.00 - $ 92.00 On Sale! Deployed at the forefront of battle, a Sacristan Forgeshrine forms a vital support hub for knightly lances. Vital rituals are carried out here, the Forgeshrine’s Auto-Sacristan offering repairs, refuelling and reloading of shieldbreaker missiles as Noble pilots require. #GAW 64-74 - Price: $ 40.00 - $ 32.00 On Sale! 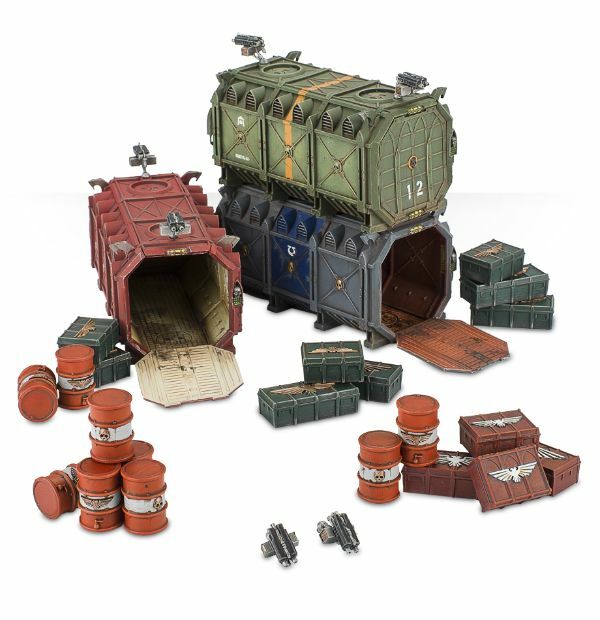 Add some easily-assembled scenery to your games of Warhammer 40,000 with this set. In it, you’ll find 4 detailed ruined wall sections, 2 each of 2 unique designs, which slot together quickly and easily with no glue required. There are also 2 access hatches and 4 barricades. 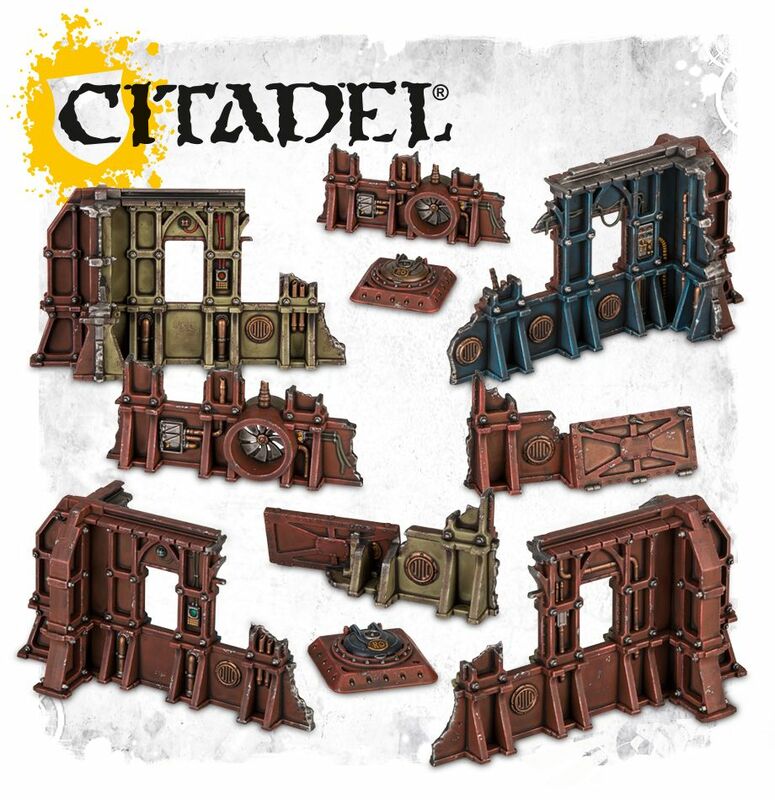 This is a set of pre-coloured brown plastic components, which has been designed to match with the Sector Mechanicus scenery sets – pick up this set, slot it together and you’ve got some perfect pieces with which to block lines of sight, create chokepoints and use as cover. #GAW 64-71 - Price: $ 30.00 - $ 24.00 On Sale! Used to control the flow of scorching plasma from generator to final destination, these Plasma Regulators can be used as cover by the brave (or foolish) – they have a tendency to leak their meltingly-hot cargo when hit by stray gunfire. 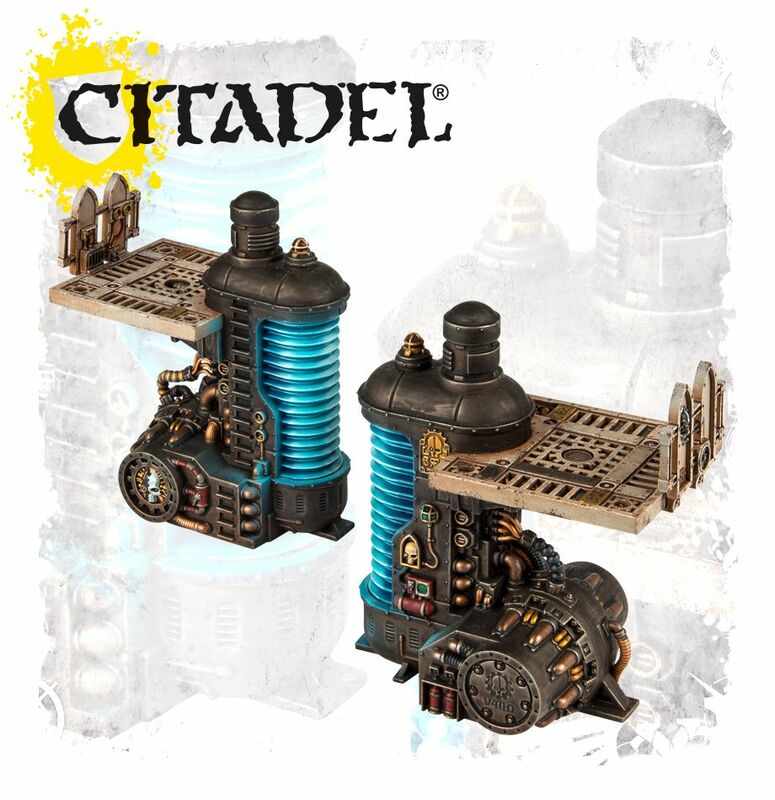 This kit contains 2 Thermic Plasma Regulators – each is a detailed plastic scenery piece, which is compatible with the Sector Mechanicus scenery range. The main body of the Regulators feature a small platform and guard rail, from which your miniatures can fight. #GAW 64-23 - Price: $ 25.00 - $ 20.00 On Sale!